You’ll recall that in the last blog post we were performing ChessBase 11 searches for Magnus Carlsen’s games, then looking at his results as White and Black as separate pie charts. 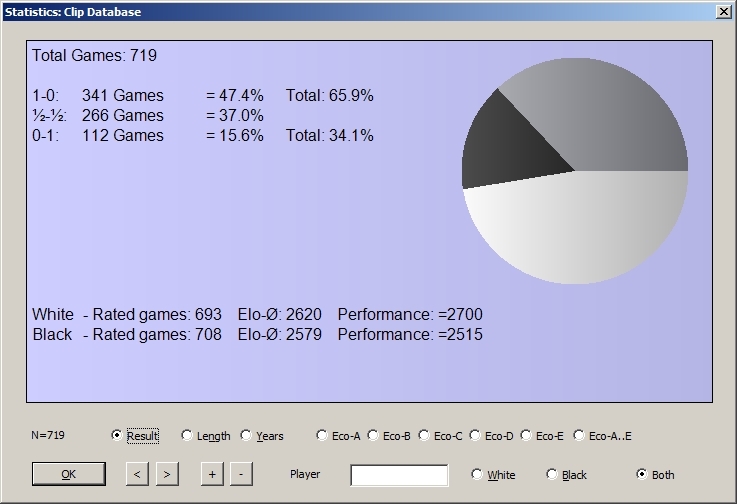 This time around we’re going to look at other statistical displays available in the ChessBase software. The numbers along the bottom of the graph (a.k.a. 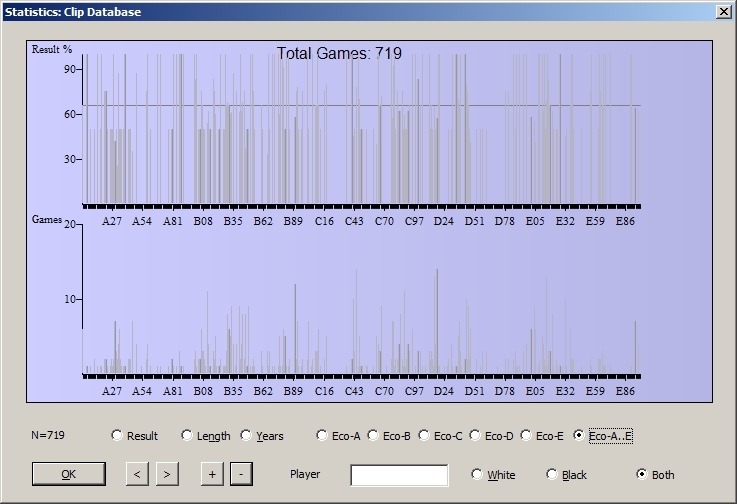 the x axis, for the mathematically inclinded) refer to the game length in moves. 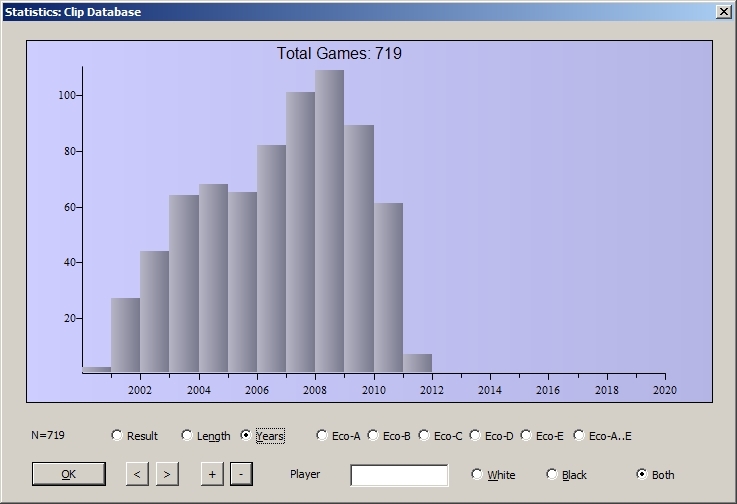 The numbers along the left side of the graph (the y axis) show the number of games in which a particular number of moves was played. So, for example, we can look at “39” for the “Length” value (along the x axis) and see from the height of the bar that twenty-seven of Carlsen’s games as White lasted exactly thirty-nine moves. 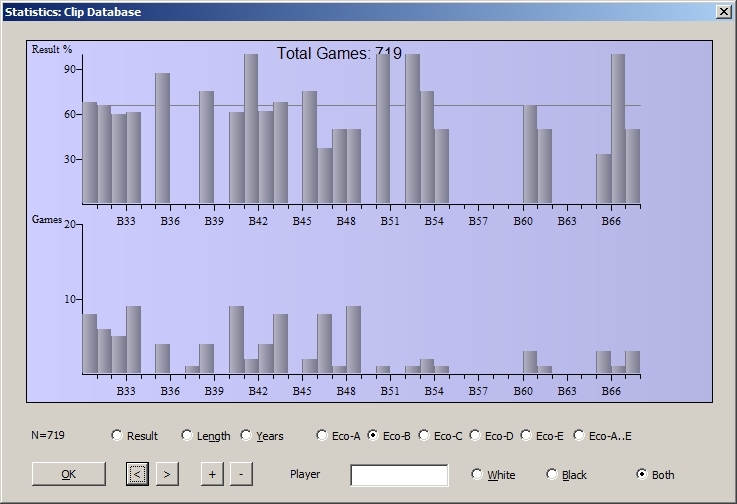 We can see that the database contains more than a hundred games from 2008 in which Carlsen played the White pieces. 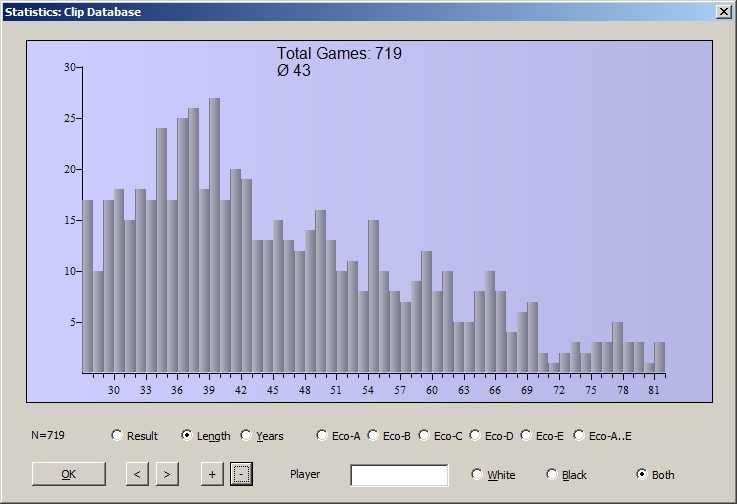 The lower part of the graph is just a straight game count. 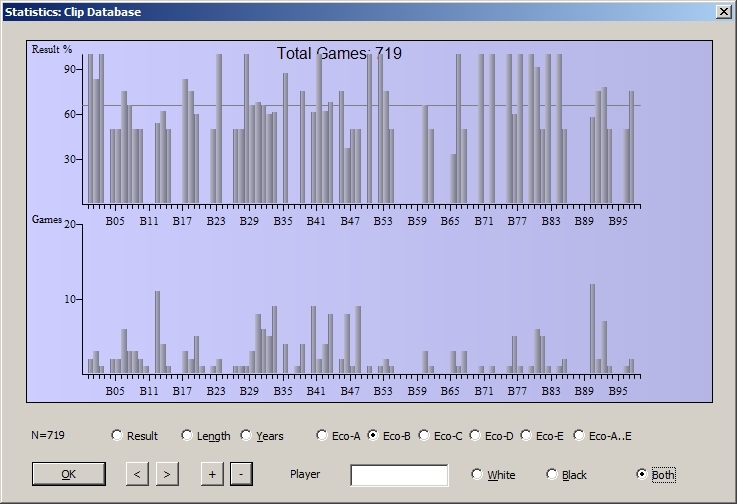 The ECO codes are given along the bottom (the x axis) of the display while the height of the bar shows the number of games. 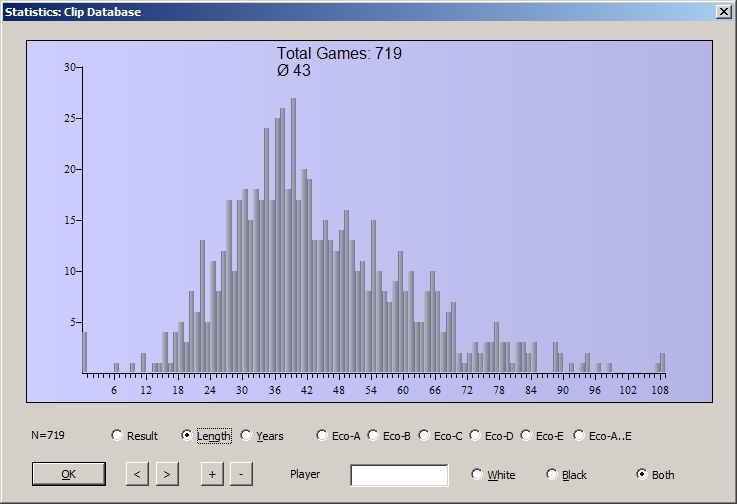 The upper part of the graph is a graphical display of game results. Again the ECO codes are provided along the bottom of the graph. But in this display the height of the bar indicates whether White or Black won most of the games. The higher the bar, the better White (Carlsen) did in that opening, while shorter bars indicate favorable results for Black (in this case, Carlsen’s opponents). The thin horizontal line does not indicate draws (a “draw line” would be at 50%, which would be lower down on the graph). You might recall from the “pie chart” in the last blog post that Carlsen scores 65.9% with the White pieces; that’s what the thin horizontal line is indicating here. Look closely and you’ll see that it’s about two-thirds of the way up the graph from the bottom. The “left arrow” and “right arrow” buttons (directly to the right of the “OK” button) allow you to “slide” the display left and right (along the x axis) so that you can see the results for various ECO codes. 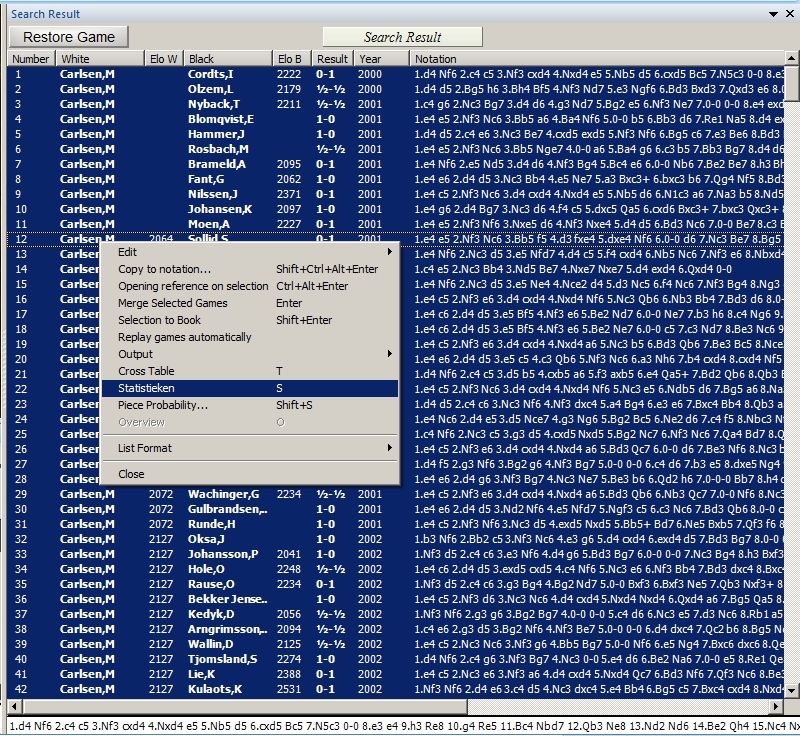 Just click once on a game to replay it directly in the search results window or double-click on it to open it in its own game window in ChessBase 11. Cool post, I’ve been playing chess since I was eleven, never get bored of it.